This is a very very easy no fuzz dish and done in microwave. And who doesn’t love potatoes? Chop potatoes in chunks or slices or whatever way you like. But try to keep it small else will take longer to cook. I kept the skin on since potatoes are home-grown else remove skin. Not from my garden though. Coming from my mgr’s dad’s garden. Yes we @ work share our veggie bounties ,plants, recipes. Take potato chunks into microwave bowl. 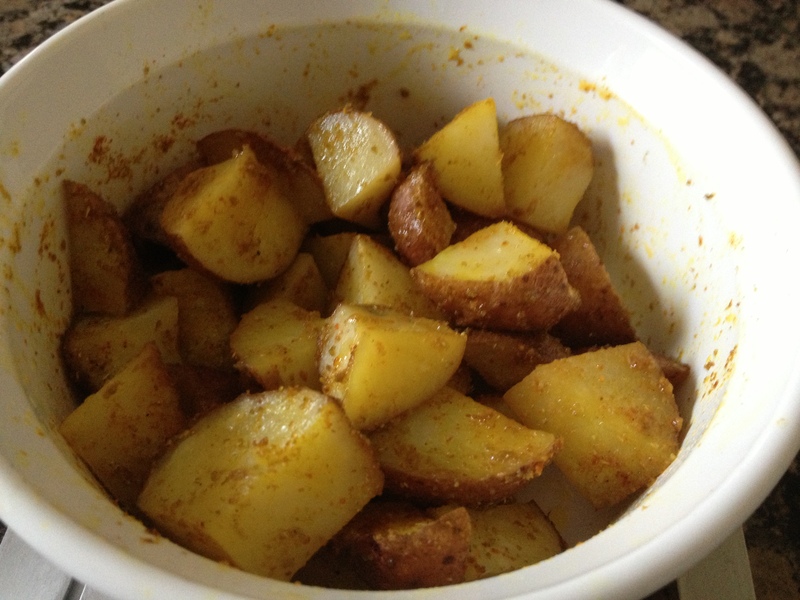 For 1 small to medium potato, use pinch of turmeric powder, 1/4 tsp red chilli powder(more if you like it spicy), 1 tsp coriander-cumin powder mix. Or 1/2 tsp cumin powder + 1/2 tsp coriander powder if you have them separate. Add salt. Add good quality oil like olive oil, peanut oil or use butter. 1 or 2 tbsp depending on how much fat you want to add. Mix everything. Microwave for 2 mins. Mix and microwave again for 2 mins. If not done, cook little more. You can garnish with cilantro or green onion. Tip: I always use glass bowl in microwave. No plastic in microwave for me.